Real Estate Industry has come to depend on photographs for their marketing. The relationship has grown so strong that a whole lot of photographic work is associated with real estate industry. Real Estate Photography has become highly technical and a lot of photo manipulation has come to be associated with it and the whole services comprising of Real Estate Photographer, real estate photo processing, consisting of editing, image manipulation enhancements, corrections like white balancing, lens distortion corrections, changing the look of the sky and creations and additions are all involved in the present day real estate photography. The whole photo enhancement requirements of this segment have spawned a whole lot of service providers called real estate photography services. The digital industry has developed and continues to develop ever more powerful tools to meet the demands of sophistication of real estate photography industry. The finished product should be extremely beautiful and appealing and should be capable of creating and developing an irresistible desire in the viewer to own the property, a matter of owner’s pride and neighbor’s envy. Producing such a photograph of a property is real estate photography. This, needless to say, involves a host of steps and some of the important steps are given below. 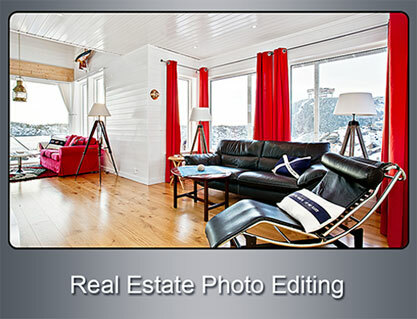 All these steps enhance the appearance and are collectively called Real Estate Photo Editing. The sky in any photo, especially, a real estate photo makes a huge difference to the photo. The color, clouds and the light cannot be ordered of nature. The availability of these conditions across the world differs widely. Under the circumstances there are only two options one of which is to wait for the condition or create the one that you need. A third one is to take photos of the various sky conditions and try to incorporate into your photo. Evidently the first and the last are not of practical use. So the only option is to create one you need. Introducing an existing image to new one also involves technology and fortunately the one to create a sky that suits your needs is akin to the one needed to incorporate an existing image into new one. The creation of a sky of a required type on a real estate photo is Sky Change services. There is whole lot of grays between white and black. With the correct balance the shade will enhance the visual appearance of a photo. Most modern cameras are capable of taking photos at a large number of settings of white balance and these can be set on auto. In spite of all the sophistications in cameras often a fine tuning is required and very powerful computer tools are available today. Needless to say, these are jobs best executed by experienced people and if to be done in numbers and within tight time schedules a competent professional group like PHOTO EDITING INDIA who has the skilled and experienced staff and required software under one roof. HDR means high dynamic range processing. The human eye-brain system has a high range of brightness and darkness. A camera, unfortunately cannot and technology has to intervene to produce a photograph with high quality photo required by the real estate industry. The constraints of real estate photography often force the photographer to take photos at varying exposures and apertures. Such photos cannot be blended to form a high quality picture. It is in this the technology of HDR photography and photographic processing comes handy. In this photos are taken at varying apertures and exposures and then blended to produce a beautiful picture of uniform texture with the help of powerful software. Image Stitching is the process of modifying the perspective of images and blending them, so that the photographs can be aligned seamlessly to get a panoramic view of excellent quality. Often in real estate photography the pictures are taken in segments. Needless to say the exposure and other parameters of each photograph will be different and you need to homogenise these photos and combine them into a composite picture that looks like one photo. Professional groups who provide photo blending, stitching and other associated services are known as panorama service providers. The real estate photographer is always faced with the problems of dust. Dust, ever present at sites, settles on the lens and detectors and it is well-nigh impossible to keep them off from camera lens and detectors. Often you have to take recourse to their removal from the photo in post photo services. There are powerful software to do this with great nicety and fast. These are sophisticated work and for quality and speed it is much better to seek the services of agencies like Photo Editing India, who are one of the best people who offer the entire gamut of photo editing and other photo manipulation services. The region where most of the brightness values are present is called the "tonal range." Tonal range can vary drastically differ from image to image, so developing an intuition for how numbers map to actual brightness values is often critical—both before and after the photo has been taken. There is no one "ideal histogram" which all images should try to mimic; histograms should merely be representative of the tonal range in the scene and what the photographer wishes to convey. An ideal photograph is one in which the tones are not extremes and the tone changes gradually without any abrupt changes. This is achieved by tone adjustment. This operation is essential in real estate photography as many of the photos are taken at different times and settings. It is essential, in stitched panoramic view; the tone is adjusted to give the photos a pleasing look. It is very evident that modern real estate photography is artistic and highly technical. The requirements of quality can be taxing and you need a high degree of knowledge of the various editing and manipulation skill to use them and an artistic bend to achieve the consummate real estate photo. It is imperative that the help of well qualified, experienced and reputed professional service providers like Photo Editing India is employed for consistent high quality products within tight time schedules. PHOTO EDITING INDIA has the required infrastructure, competence, skilled staff and experience to deliver products on time.